18 holes, par 71, 7493 yards. Parkland. The magnificent Twenty Ten Course at Celtic Manor was specifically designed by Ross McMurray for the 2010 Ryder Cup where Europe emerged victorious. 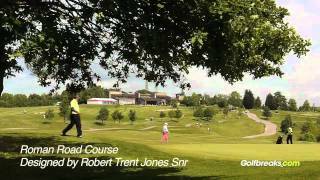 The golf course opened in 2007 and has since become one of the finest courses in Wales, boasting a considerable variety and challenges across all 18 holes. At 7,493 yards, the Twenty Ten course is significantly longer than the majority of courses in wales, providing a testing challenge to even the bigger hitters. Celtic Manor has a great range of variety - from classic links holes, to long doglegs with water hazards, there is something to suit everyone’s game and golfers will never find themselves bored of playing this illustrious course. Designed to be exciting and demanding to the world’s best professionals, the Twenty Ten has no less than 6 signature holes. The 18th is a particularly difficult closing hole, with long sloping fairways, water hazards, and a difficult green to get at in regulation. This course really is one of the best in Wales, and although it may not have the history of some of the other courses, it is the first of its kind. You may be asked for a handicap certificate on arrival, although there are no guarantees. Golf carts are available from the pro shop for £30. Electric trolleys and pull trolleys are also available on arrival. As this is a resort golf course, we normally suggest for you to book your tee times as early as possible. You may be paired up if the course becomes overly congested, although Celtic Manor will try and avoid this whenever possible.